A Year of Being Here: Mary Oliver: "Winter and the Nuthatch"
the nuthatch was flying into a stranger's hand. I'll come tomorrow, I believe, quite early. "Winter and the Nuthatch" by Mary Oliver, from Red Bird: Poems. © Beacon Press, 2008. 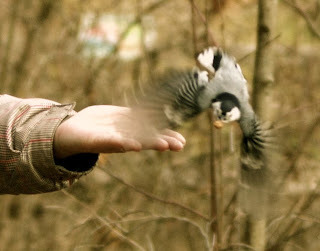 Photography credit: "A White-breasted Nuthatch surprised my wife with a visit," detail from an image by fotogordo (originally color). 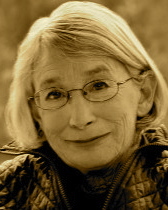 I love Mary Oliver. I love the way she sometimes teases herself in her poems. She seems like such a real person.